The cherry rum and black currant Cointreau came out beautifully, as did the vanilla latte. Â The rosemary quince is heavier on rosemary and shorter on quince flavor than I would have liked, but still tastes excellent. Â I don’t really like the goat cheese and honey – the goat cheese flavor is mostly indistinguishable and it has a slightly gritty texture from the curdled bits of goat cheese (I boiled it to sterilize it). Â It tastes good, mind you, but mostly it tastes like honey, not goat cheese. Â I may drop it if I run out of space. I’m a bit worried that the chocolates will come out looking boring since virtually all of them will be monochromatic (the printing is all gold); next year, I think I’ll have some more custom transfer sheets printed up, this time in red. Â That ought to jazz things up nicely, and red is the Â traditional Chinese color for celebration + a classic Christmas color, so quite appropriate to the occasion. 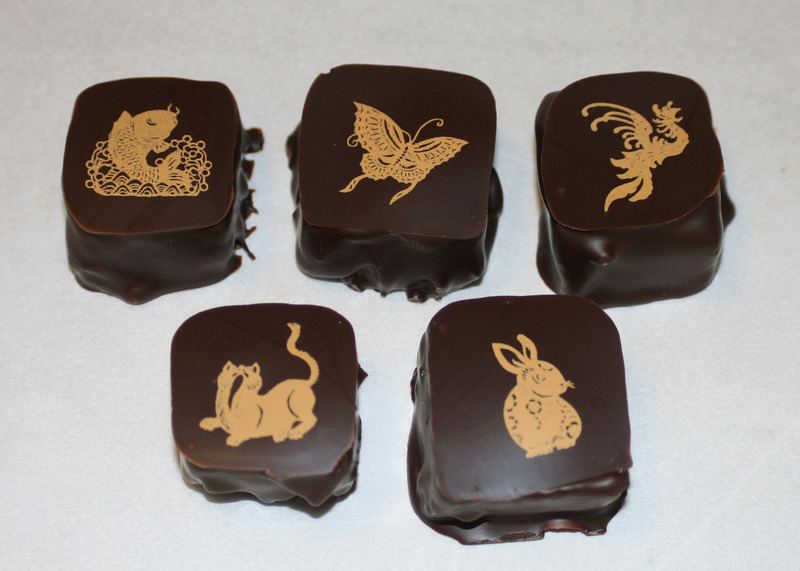 In addition to the five chocolates shown here, my friends and I mixed up four flavors to start off with tomorrow: saffron, three-chili (ancho, guajillo, chipotle chilies), pink peppercorn-Buddha’s hand citron-yuzu, and cardamom-ginger-rosewater. Â That leaves only three flavors: jasmine tea, Irish coffee, kaffir lime-lemongrass-ginger-coconut. Â It’s entirely conceivable that we could finish all of those tomorrow, leaving me a free day on Saturday! Â (Sunday is the chocolate-packing party.) Â If so, the first thing I’ll do after cleaning up the kitchen is hightail it outside, to dye the 12 panels for my next muslin.